You’re going to immediately wonder why you don’t make this more often. When out at a Mexican restaurant and the server walks by with a super hot sizzling plate of fajitas it’s impossible not to notice all of the steam coming from the fajitas and the amazingly delicious smell. 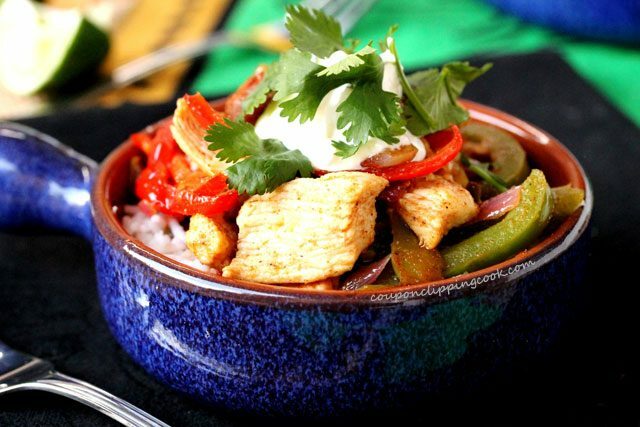 It’s the fajita sauce that makes the meat and vegetables taste so good. 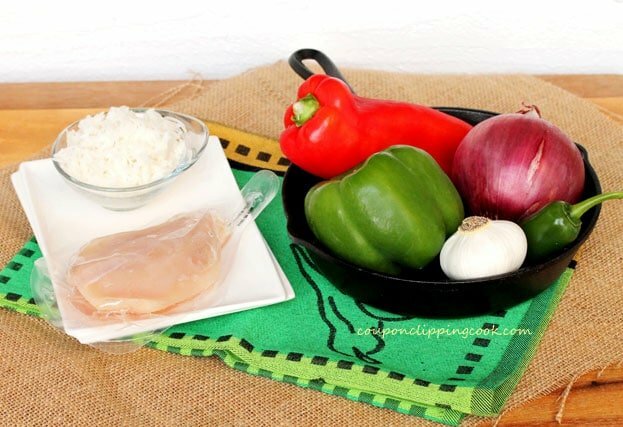 In this fajita recipe there is a quick and easy homemade fajita sauce that has just a handful of ingredients so now you can make fajitas right in your very own kitchen. Since I’m a fan of recipes made with homemade fajita sauce, here are some more recipes you may like Chicken Fajita Quesadillas, and Fajita Brussels Sprouts. 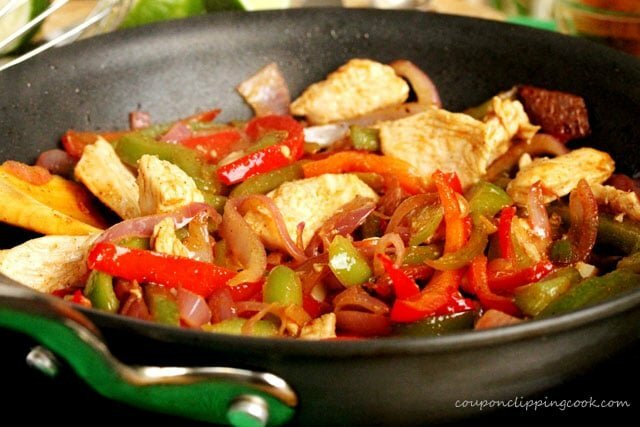 For this chipotle chicken fajita recipe, no worries if you don’t have one of those fancy iron skillets that the restaurants serve fajitas in because any plate or bowl will do. 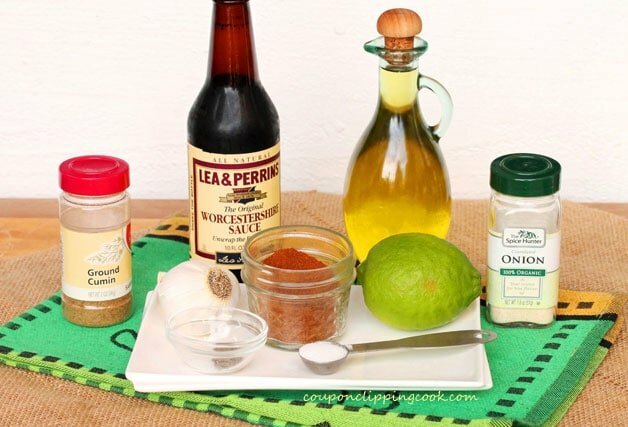 With the exception of the chipotle chili powder which you may not have on hand, the ingredients for this recipe come right out of the pantry. If you just have regular chili powder on hand feel free to use it as a substitute for the chipotle chili powder. A great way to find different types of chili powder at a good price is to look at the Hispanic food section in the grocery store where the cellophane packets of spices are hanging. This is where I found chipotle chili powder that has such a wonderful smokey flavor. 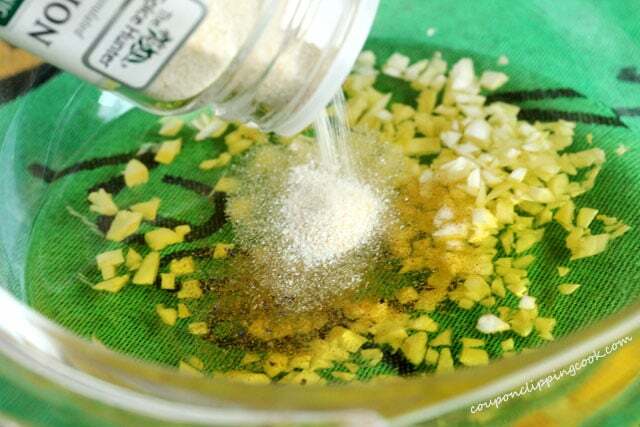 The hardest part about using the spices and herbs in cellophane packets is keeping them fresh after the package is opened. I found that the small 4 ounce canning jars are a great size to store them in (picture of this jar below). 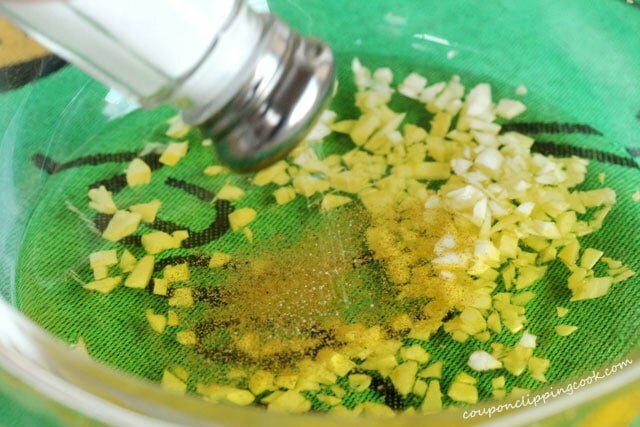 Just remember to cut out the name of the spice or herb from the cellophane packet label, and put it in the jar with the spice or on top with a little piece of plastic wrap in between the flat part of the lid and the outer ring. 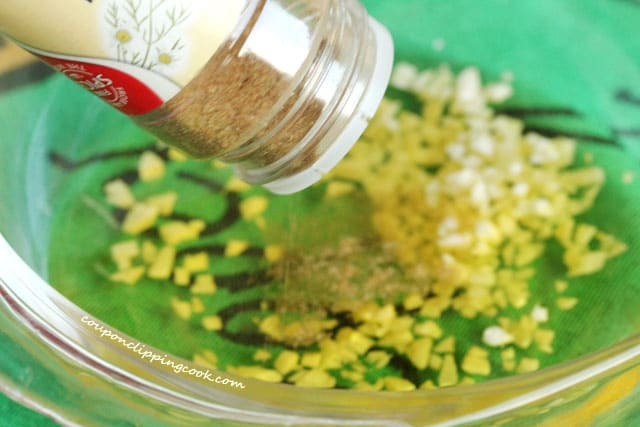 This way you don’t forget what kind of chili powder or spice it is. And also jot down the date so you can replace it when it’s too old. 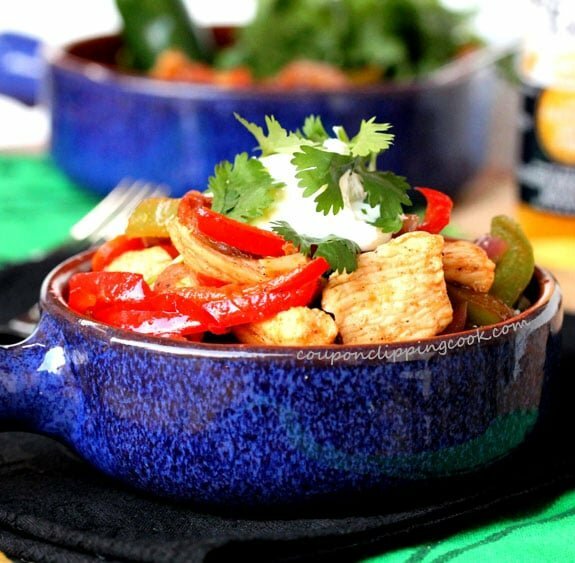 This fajita recipe is made with a boneless skinless chicken breast which I love to have on hand for quick impromptu meals. The individually wrapped frozen chicken breasts that are in a big bag are especially handy to have on hand in the freezer. I like that they don’t get stuck together like the ones that aren’t individually wrapped. It’s one of my regular go-to items at Costco. 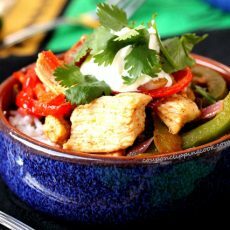 These chicken fajitas can be served over rice or for a heartier meal they can be served over black or pinto beans. 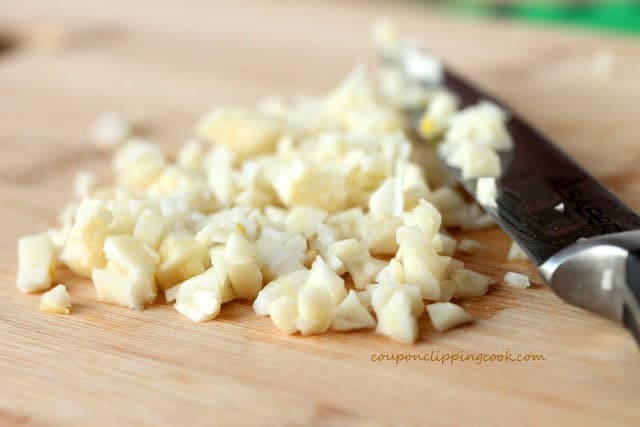 Chop the garlic and add it to a medium size bowl. and the chipotle chili powder. 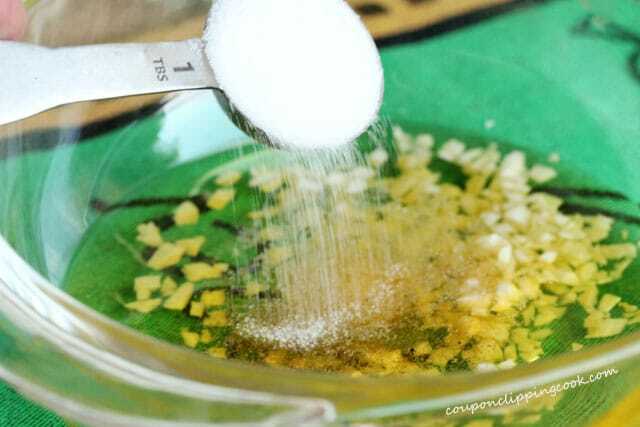 Whisk together all ingredients. 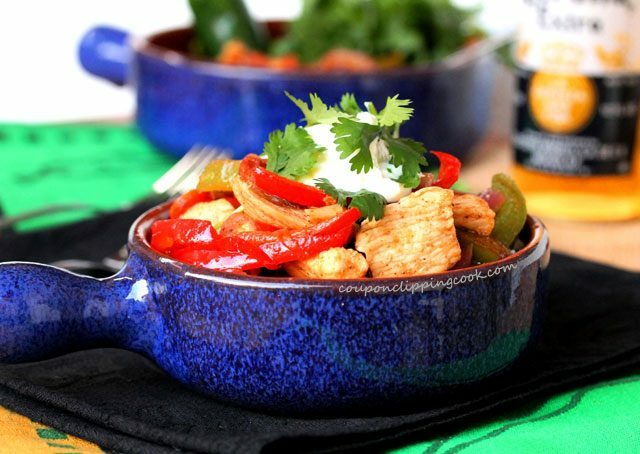 Transfer the fajita sauce to a large shallow bowl or casserole dish and set aside for a moment. 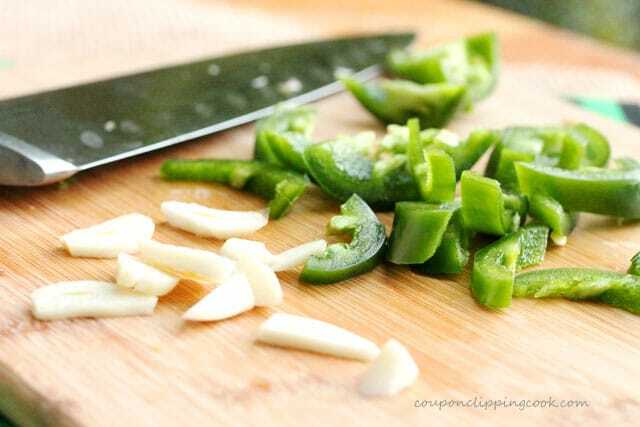 …chop the garlic, and remove the seeds from the jalapeno and cut it into larger size pieces. 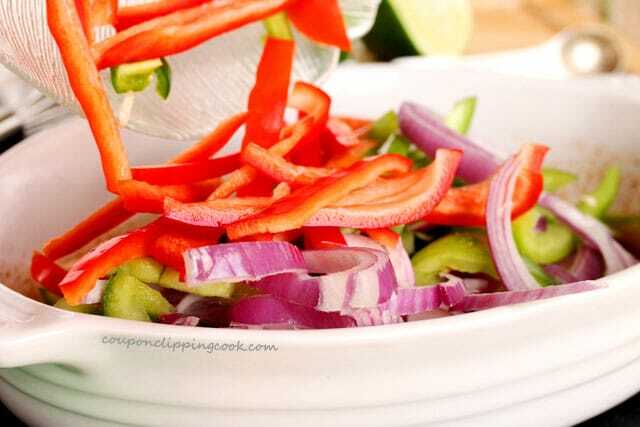 Give the fajita sauce another whisk and add the vegetables to the shallow bowl. 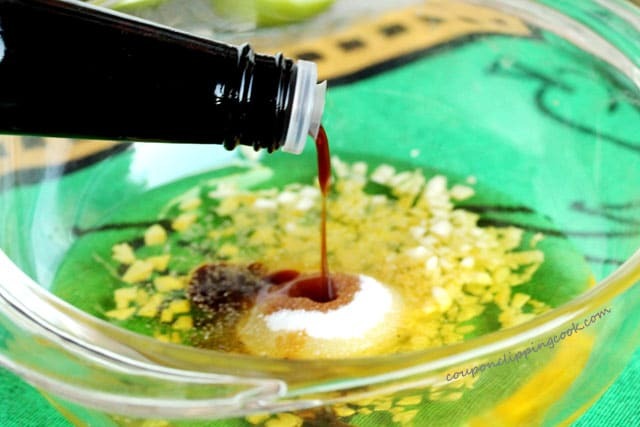 …and let marinate for an hour or more if you have the time. 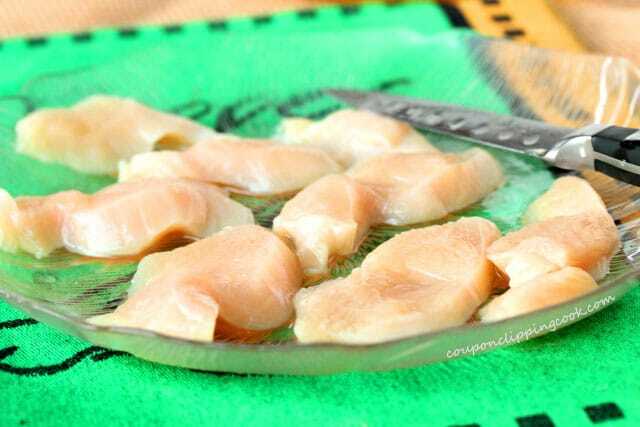 Cut the chicken breast into lengthwise slices and set aside for a moment. 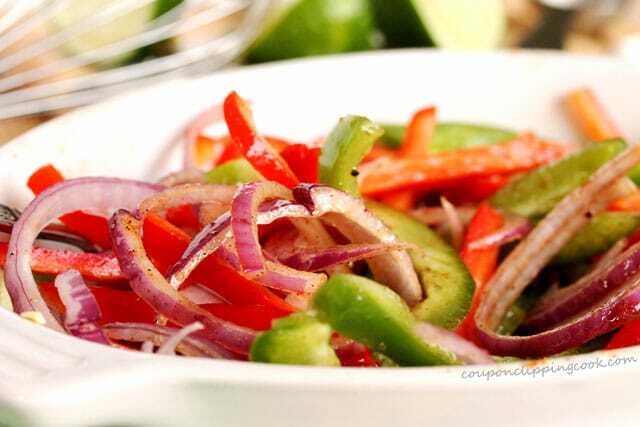 To the pan, add the olive oil and vegetables reserving about 1 to 2 tablespoons of fajita sauce in the shallow bowl. Stir as the vegetables are cooking. Sauté the vegetables for 4 to 5 minutes about the time when they start to turn brown around the edges. 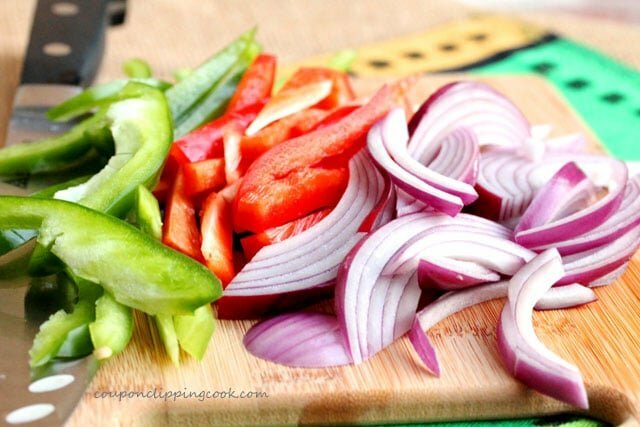 Slide the vegetables off to the outer edges of the pan to make space in the middle of the pan. Then add the chicken and remaining sauce in the middle of the pan. Stir together and continue to sauté and stir the chicken and vegetables until the chicken is thoroughly cooked (approximately 5 to 7 minutes). Serve warm over warm rice and top with sour cream. Garnish with cilantro leaves and…enjoy. You're going to immediately wonder why you don't make this more often. 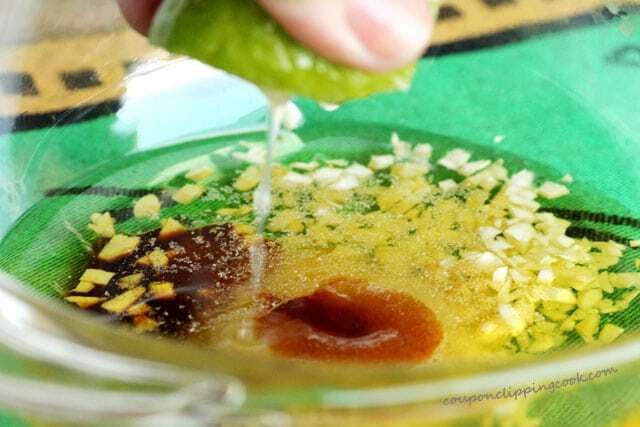 To a medium size bowl, add the garlic, olive oil, cumin, salt, onion powder, pepper, sugar, Worcestershire sauce, the juice from a whole lime, and the chipotle chili powder. Whisk together. 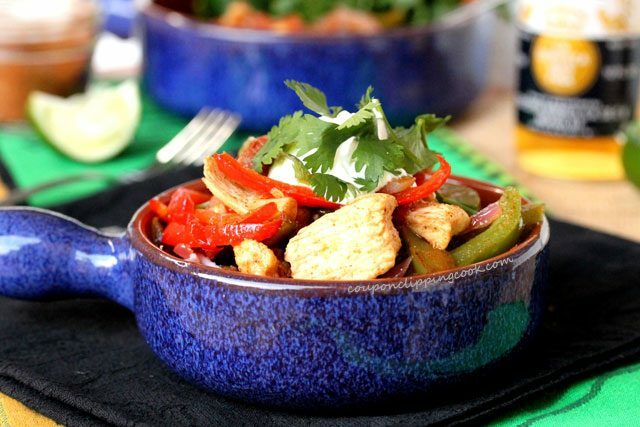 Transfer the fajita sauce to a large shallow bowl or casserole dish and set aside for a moment. 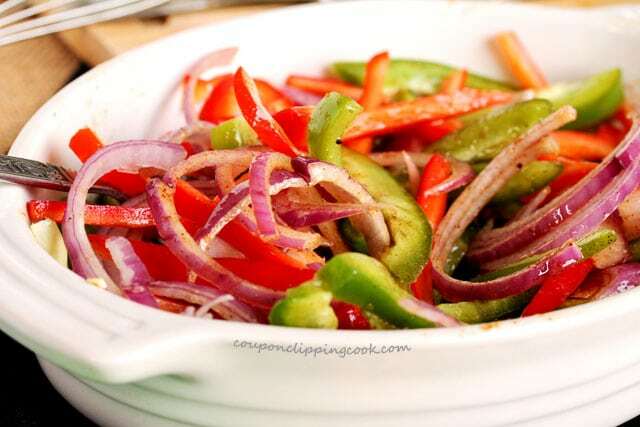 After cutting the vegetables, give the fajita sauce another whisk and add the vegetables to the shallow bowl. 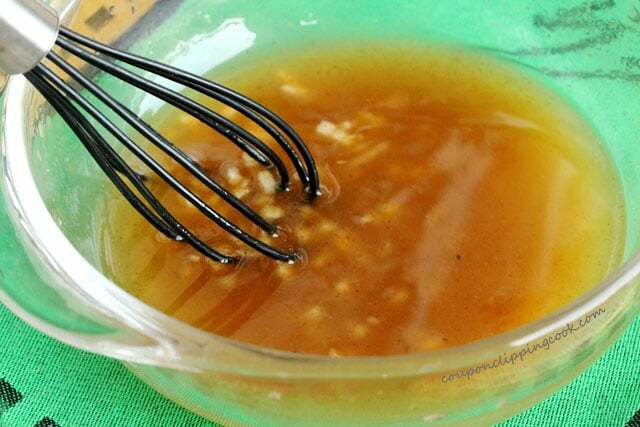 Mix the veggies in with the sauce so they’re coated and let marinate for an hour or more if you have the time. After the vegetables have marinated, cut the chicken breast into lengthwise slices and set aside for a moment. Heat a large skillet on medium heat. 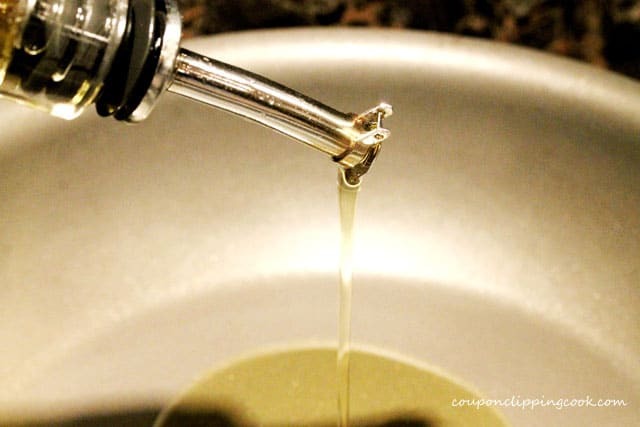 Add the olive oil and vegetables reserving about 2 tablespoons of sauce in the shallow bowl. Stir as the veggies are cooking. Sauté the veggies for about 4 to 5 minutes about the time when they start to turn brown around the edges. 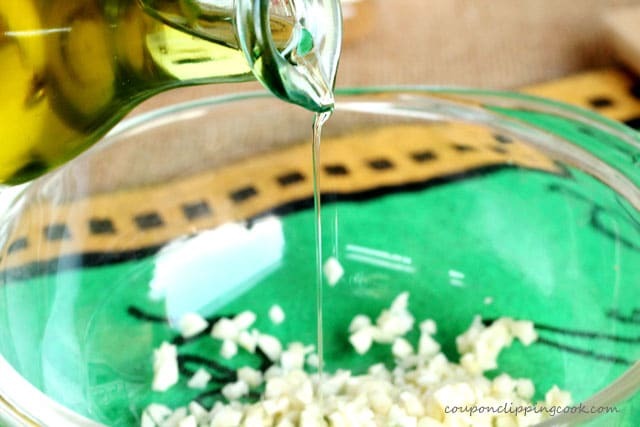 Slide the veggies off to the outer edges of the pan to make space in the middle of the pan. Then add the chicken and remaining marinade in the middle of the pan. Stir together. Continue to sauté and stir the chicken and vegetables until the chicken is thoroughly cooked (about 5 to 7 minutes). Serve warm over warm rice and top with sour cream. Garnish with cilantro leaves.